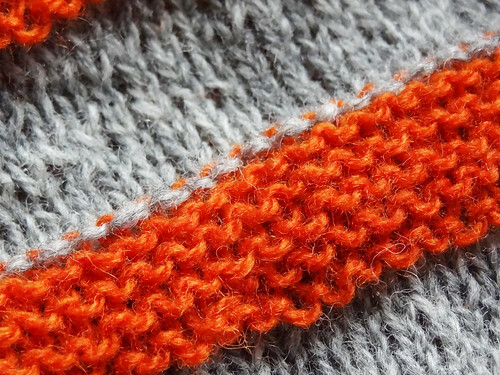 On New Year's Eve I found myself surfing around the 'net and found something I felt compelled to at least attempt to join in with, a new idea buzzing around Twitter and Ravelry, the idea of "Knit The Queue 2013" (KTQ). This is a brainchild of Mooncalfmakes. To take part, in some form or another, I decided to make a section of my queue that I realistically wanted to tackle this year. I specifically chose patterns that I really wanted to make and that I actually had yarn for. This would be part of a two pronged attack, including the Challenge To Myself (CTM) to reduce my stash. I have created a sub-set of my queue, which you can see here. It numbered 22 items with a good mix of project type. On 1st January, in accordance with my CTM plans, I went to my first box under the spare bed and determinedly looked away whilst lifting the lid. I rummaged around and grabbed a plastic bag and tugged it free. I then nearly cheated and threw it back. The yarn I had freed from the stash was part of a collection of several plastic bags. I had freed the Debbie Bliss Fez I received in compensation for a ruined baby blanket I knit 2 and a half years ago! This particular yarn constitutes a rather large portion of my first box of stash. I have 20 skeins of this stuff. I have sat on it for 2 and a half years because it is, by far, my most valuable yarn. I never buy this sort of quantity of yarn, and certainly never buy this sort of yarn at it's full price. I have sat on this yarn because I was scared to ruin it, because it is so lovely. This aran weight yarn is comprised of 85% extrafine merino and 15% camel. It is so soft and fuzzy, yet plump and rounded. I am pretty proud of myself for not caving in to my baser instincts. In my head I assumed that most of my CTM projects would involves single skein or at the most a couple of skeins. It was probably silly of me to think that way, but I did. With that in mind, I am so pleased I pulled all the Fez out of the stash and headed downstairs to examine my yarn and Ravelry. When I looked at Ravelry, one of the items on my KTQ list was Melia from Little Red in The City, which I reviewed in 2011. I have always wanted to pair up this yarn and this pattern and it seems that now is the time to act on that decision. I have swatched the yarn in a generous sized piece of fabric. 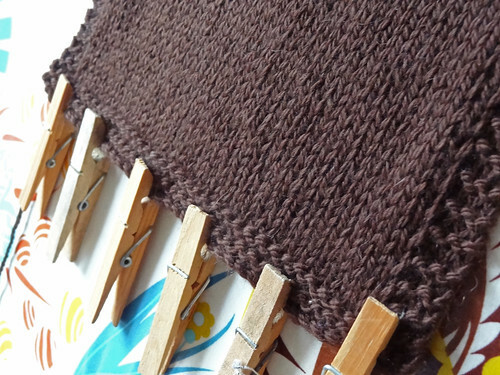 I wet blocked the fabric gently, and then after it was dry, hung it up with wooden clothes pegs suspended from the bottom edge of the swatch. This method of putting the swatch under tension was a tip I got from Little Red in The City and it seems a sensible one when this pattern has very large pieces of stocking stitch in it. I think I have got gauge first time, but I need to leave the swatch to settle for a few days first. I love the stitch definition on this swatch. The fabric is dense but still has gorgeous drape to it. The swatch has made me really excited about knitting this garment, especially as I think it will be a really useful addition to my wardrobe. Whilst that swatch is being put under tension, I have been motoring on with my Pterodactyl. I've reached the last wedge of orange before the border. I'm trying to decided whether to add any more wedges because I still have lots of yarn left. The shawl, as directed in the pattern, is quite shallow, and I prefer my shawls to be deeper at the back. 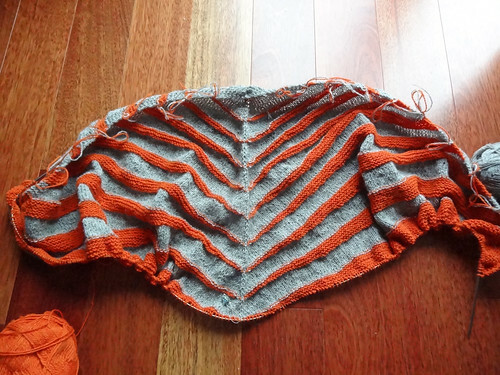 I might put a lifeline in at the point where the border should be knitted and then it will be easy to rip back if I decide I've made a mistake by adding extra wedges. I want to keep on knitting this shawl not only be because I like my shawls deep, but also because it's so pretty! I think that is plenty to be getting on with in my first WIP Wednesday post of the year. I'm quite looking forward to settling into my new knitting routines! 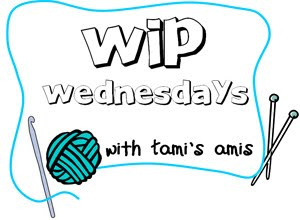 If you want to see what other WIPs are in progress, click on the button. Remember there is still time to vote on the hat pattern you want to knit with my KAL (the pattern chosen will be reduced in price for the KAL).